An unfathomable saga of my Sri Lanka vacation gala is still fresh in my mind and I can throb even four years after it. Probably the encounter with the loving pachyderms, icon of Sri Lankan tourism, the elephant family was quite an experience. Or playing with the pythons made it different, or greens and sun forming myriad colours in the wide ocean. Or that, this was holiday where we did not make serious agenda. Holidays should be flexible. This one was. 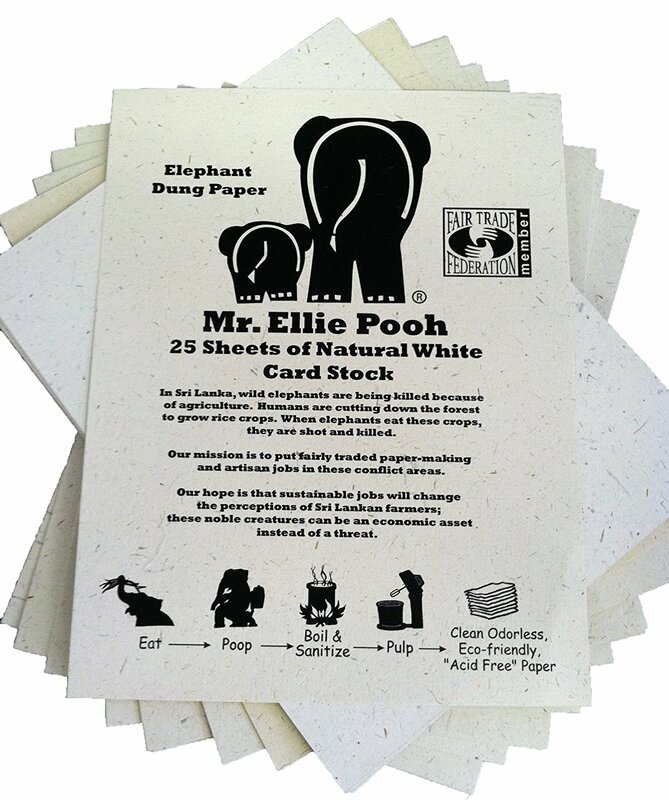 Especially after an affair with these elephants and knowing even that their dung was used to make paper, we got hooked onto the place. Here is the link to the old brief travelogue I had written. - A Week At Ravan's Place. Exploring Sri Lanka. A Place that was originally was found in 1975 for holding best disposition of ex-situ animal care. In 25 acre coconut plantation jungle, adjacent to "Maha Oya " river, elephants are bred and well taken care of. Just as name holds, the set up was founded to care for abandoned elephants. Those that strayed away, or fell in mining pits or who ended up spoiling farmers crops . A splendid encounter it is in such close quarters with these jumbos and little jumbos. Elephant was a friend always. For me from Udupi the temple town. There was always this mammoth friend with it's fascinating trunk in the Sri Krishna Temple premises whom I talked to as child. This brief interaction in SriLanka was a delight. Kissing another being felt like being human. Bottle milk feeding activity to keep tourists engaged! Pinnawala mahouts feed the baby elephants less than 3 yr of age with bottle milk. Also encourage the friendly visitors too to indulge in feeding activity. As for my experience this little jumbo gulped up the bottle before we could have our camera shutter buzz. Timing maintained are for thirty minutes twice a day. 9.15A.M and 1.30 noon. Baby elephants are left in their play pen for few hours, especially as exhibit for visitors too! With the their favorite veggies hanging on the rails the babies stay there for few hours of the morning after their bath. The lactating mothers are generally very very compassionate toward their calves and nurture them lovingly in their presence. While most elephants march in herds to the river for their daily bathing ritual, a few are isolated. Either the wounded ones or the aggressive ones and trained with hose of water to bathe themselves. Spectators are welcomed too to view and accompany them. A few naughty ones would splash some water on you too. Every morning bathing sessions are regimen essential. So, the jumbos stay hale and hearty. They are guided by security personnel and the mahouts and march towards river at 10 AM only to return by 12 noon. A pleasurable scene, the brown pachyderm march to the river. Alongside the street are laid those small vendors who sell souvenirs. All the types that we can expect. Clothes, caps, mugs with the jumbo picture on it. 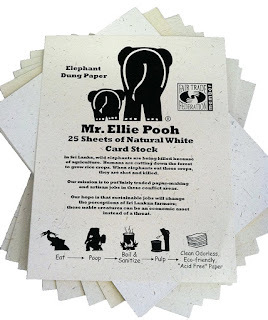 Have you ever had any idea seeing the elephant's rear end, that it's dung could be a raw material while paper the finished product? I was drowned in poop heap thoughts. While millions of trees are chopped down in the world, few environmental enthusiasts have found eco-friendly solutions. The elephant dung to make paper indeed! "Fibre" is the keyword, as their diet and dung both are rich in it. 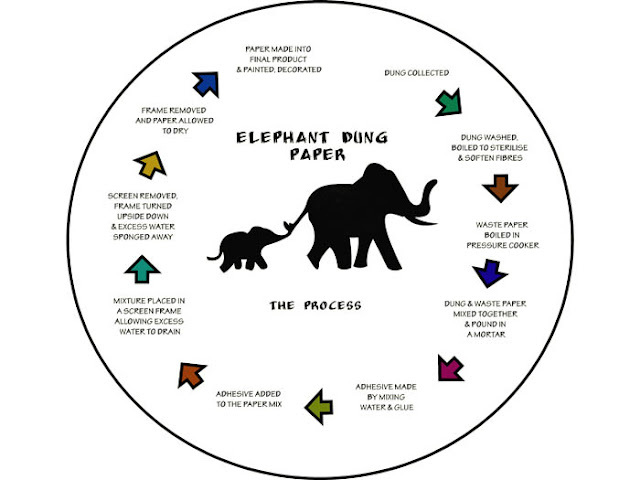 Collecting the dung - is collected from various elephant stables. The cleaning of the dung - Dung is washed thoroughly with water in large tanks. At the end, all what is left is the fibre. Cooking the poo - To get the fibre ready for the next stage of pulping, it is cooked in water for over 4-5 hours with salt and then washed with hydrogen peroxide to complete the first stage of making the paper bacteria free. Sorting - The water is drained out and the dung is left to dry out in the sun. Once its dry, it is sorted and any non-usable fibre is removed. Pulping- After the fibre has been softened and sorted, it goes into the Hollander Beater, to be beaten to pulp. This process takes about 4 hours. The fibre goes through the process of being beaten into very fine pulp and also being washed again. Lifting Up - The pulp is then taken to cement/ wooden vats filled with water. Depending on the weight of the paper to be made, the required amount of pulp is mixed with the water. A flat sieve-like mould is used to lift a layer of pulp out of water. A sheet of paper is made. Moulding -The sheet is then placed on a muslin cloth by applying gentle pressure onto the mould. This process continues till there is a heap of about 100 sheets. Drying - The heap of interleaved sheets is then placed in a hydraulic press and compressed to drain out as much water as possible. The paper is then dried on lines, in a shady area. Direct sunlight is not good for drying the sheets unless they’re white as the colour fades under the sun. Rolling -Paper sheets are then rolled in d to make them smoother and writable. The sheets are then cut to the specified size, packed and sent to their required destinations. Products range includes books, flip-flops, hand bags, picture albums, tags, gift bags, photo frames, and whole lot of funky stuff. Few called me daring, then a few called the python daring!! At the exterior gate of the Orphanage we encountered these slithering friends. 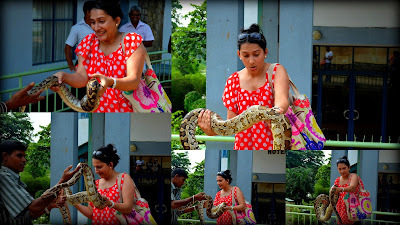 First time ever, I held this spineless yet creepy python in my hands. Bit squeamish, but overtaken by confidence of excitement. A huge place to explore, so remember to tie your shoes tight. About 2 hours drive from Colombo city. Other places of interest around colombo are -Nuwar Eliya, Kandy ,The Seetha Temple, The Ramboda, Few national parks, tea estates and much more. The Auto Rickshaws there are called "tuk tuk" and are a pleasurable rides like the ones in India! It is an interesting way of life and it is something that I have known the story of elephants as well.